The BHS Universal Polypropylene Roll (UP-424) is 100 percent polypropylene and instantly begins absorbing liquids on contact. The UP-424 absorbs water, oil, and everything in between, including acid. 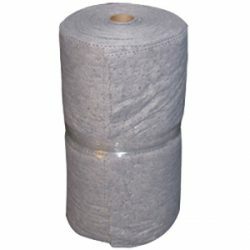 This highly absorbent material has a spun-bond cover stock on one side, while the other remains uncovered for greater traction. It is heat-sealed for extra strength when fighting tough spills. The Universal Polypropylene Roll gives warehouse operations a flexible solution for a variety of spills. Contact our sales team at +1 314 423 2075 to find out more about essential safety and spill equipment from BHS. Note: It is strongly recommended to use the UP-424 with acid neutralizer. See AcidSorb for neutralizer.